, third duke of Portland, was born in 1738, and educated at Christchurch, Oxford, where he was created M. A. Feb. 1, 1757. 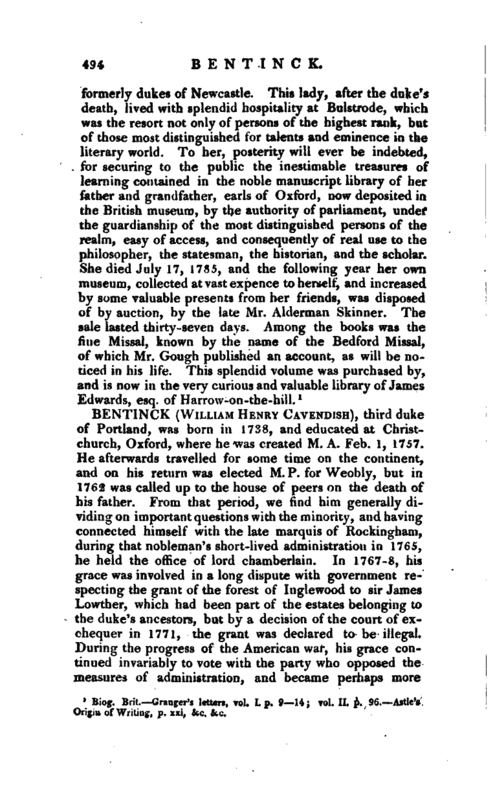 He afterwards travelled for some time on the continent, and on his return was elected M. P. for Weobly, but in 1762 was called up to the house of peers on the death of his father. From that period, we find him generally dividing on important questions with the minority, and having connected himself with the late marquis of Rockingham, during that nobleman’s short-lived administration in 1765, he held the office of lord chamberlain. In 1767-8, his grace was involved in a long dispute with government respecting the grant of the forest of Inglewood to sir James Lowther, which had been part of the estates belonging to the duke’s ancestors, but by a decision of the court of exchequer in 1771, the grant was declared to be illegal. During the progress of the Ameiican war, his grace continued invariably to vote with the party who opposed the measures of administration, and became perhaps more | closely united to them by his marriage with lady Dorothy Cavendish, sister to the duke of Devonshire. When the administration of lord North, which had conducted that unfortunate war, was dissolved in 1782, and replaced by the marquis of Rockingham, and his friends, the duke of Portland was appointed lord-lieutenant of Ireland, but owing to the death of the marquis, he remained in this office only about three months. 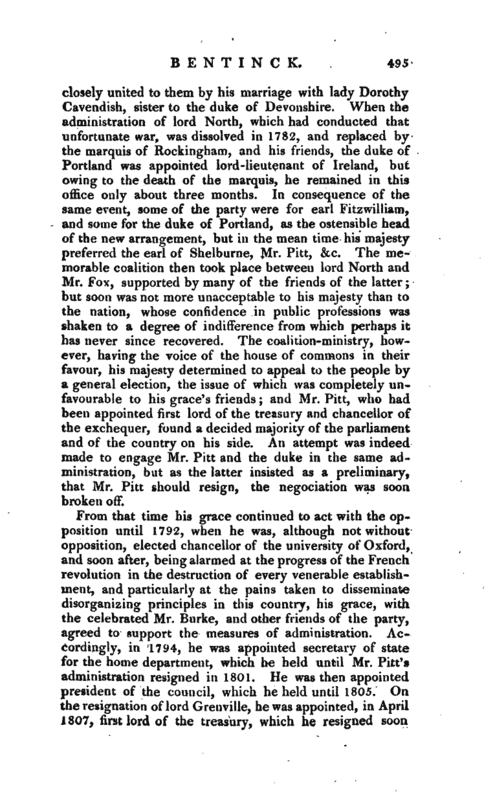 In consequence of the same event, some of the party were for earl Fitzwilliam, and some for the duke of Portland, as the ostensible head of the new arrangement, but in the mean time his majesty preferred the earl of Shelburne, Mr. Pitt, &c. The memorable coalition then took place between lord North and Mr. Fox, supported by many of the friends of the latter; but soon was not more unacceptable to his majesty than to the nation, whose confidence in public professions was shaken to a degree of indifference from which perhaps it has never since recovered. The coalition-ministry, however, having the voice of the house of commons in their favour, his majesty determined to appeal to the people by a general election, the issue of which was completely unfavourable to his grace’s friends; and Mr. Pitt, who had been appointed first lord of the treasury and chancellor of the exchequer, found a decided majority of the parliament and of the country on his side. An attempt was indeed made to engage Mr. Pitt and the duke in the same administration, but as the latter insisted as a preliminary, that Mr. Pitt should resign, the negociation was soon broken off. From that time his grace continued to act with the opposition until 1792, when he was, although not without opposition, elected chancellor of the university of Oxford, and soon after, being alarmed at the progress of the French revolution in the destruction of every venerable establishment, and particularly at the pains taken to disseminate disorganizing principles in this country, his grace, with the celebrated Mr. Burke, and other friends of the party, agreed to support the measures of administration. Accordingly, in 1794, he was appointed secretary of state for the home department, which he held until Mr. Pitt’a administration resigned in 1801. 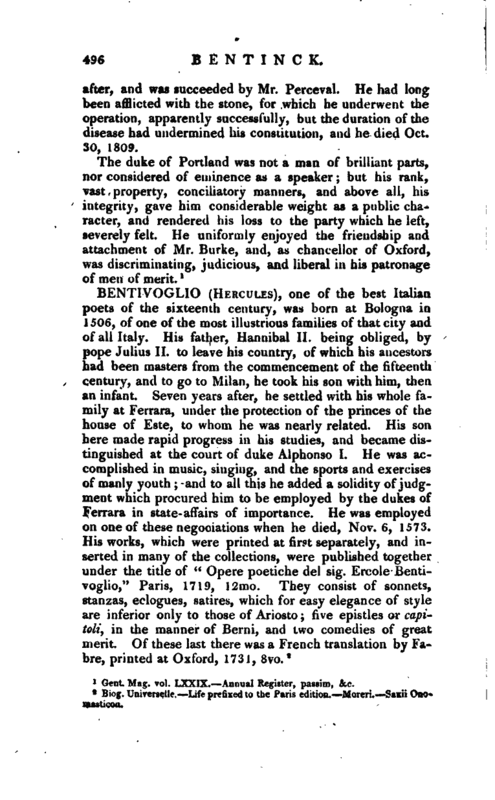 He was then appointed president of the council, which he held until 1805. On the resignation of lord Grenville, he was appointed, in April 1307, first lord of the treasury, which he resigned soon | after, and was succeeded by Mr. Perceval. He had long been afflicted with the stone, for which he underwent the operation, apparently successfully, but the duration of the disease had undermined his constitution, and he died Oct. 30, 1809. Gent. Mag. vol. LXXIX. Annual Register, passim, &c.